EDIT: The Evil Dead II discs are now finished. Please go to Page 2 to see how you may get a copy and how you can help with future discs in the Evil Dead Trilogy DVD Companion! This is part of a larger project I’m working on about the Evil Dead trilogy to gauge how much interest and support there is for such a project. 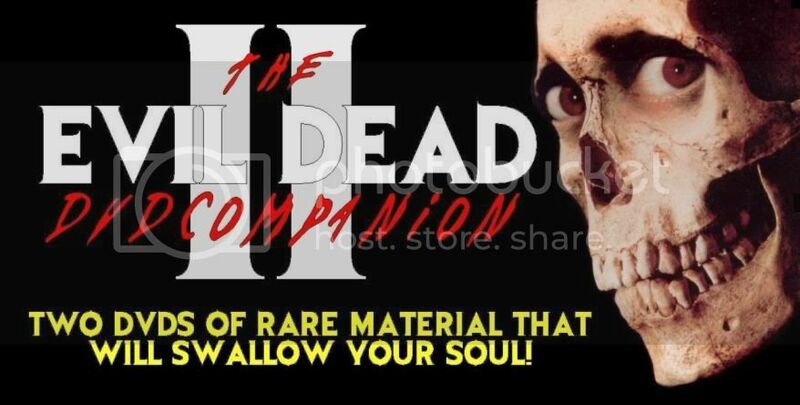 The Evil Dead II discs are the closest to completion, and as such is a pilot for a six-disc Evil Dead DVD Companion. Many thanks go to See No Evil and The Griff for providing content for these discs – but it isn’t finished yet! Disc One has been completed, but I am still collecting the content for Disc Two at the moment. The contents listed below are what I have at the moment (along with descriptions that will be on menu screens preceding the videos) – but any suggestions/donations are definitely wanted! Also, suggestions for content relating to the other films would be greatly appreciated. Because the majority of these are from bootleg sources, the quality is variable to say the least - The Directors interview is sourced from YouTube, and a few of these are shaky VHS rips. But that's better than nothing at all! The following behind-the-scenes footage was shot by special effects foreman Vern Hyde and his crew on the set of EVIL DEAD II in Wadesboro, North Carolina in 1986. It offers intimate glimpses into the filming of key effects scenes in the movie (such as “The Blood Flood”, “The Rotten Apple Head”, and Ash flying into the time portal) as well as the fun the cast and crew had making it. It is not to be confused with the footage Greg Nicotero shot on the set, as seen in “Behind The Screams” and “The Gore The Merrier”. This is an incomplete workprint of EVIL DEAD II, consisting of the first twenty and last ten minutes of the film. It features temp music (Joseph Lo Duca’s score had not been completed yet), original production audio (pre-ADR) and a small selection of short deleted scenes. This workprint is taken from a poor quality VHS, so the quality is variable at best, but as a curiosity for EVIL DEAD fans it is essential viewing. This compilation of the camcorder footage Greg Nicotero shot on the set of EVIL DEAD II was an extra on the 1998 blood red Elite laserdisc of the film. It was replaced on subsequent DVD issues by “The Gore The Merrier”, which features some of the same footage alongside new interviews with Nicotero, Howard Berger and Robert Kurtzmann. However much of the material in “Behind The Screams” has yet to make it to an official DVD release, including footage of the deleted “Evil Ed Chop Top” sequence being shot. These two TV spots, starring Sam Raimi and Jonathan Ross, were broadcast on British TV in 1987 to promote the theatrical release of EVIL DEAD II by Palace Pictures. The ads were written and directed by Christopher Fowler of The Creative Partnership, who is perhaps best known as the cult author of such best-selling books as Spanky. They had previously been seen within the exclusive “Dead Good Marketing” featurette on Anchor Bay UK’s EVIL DEAD DVD boxset. In 1982, Sam Raimi and Rob Tapert shot their first television interviews to publicise EVIL DEAD for a NY cable access programme called The Directors. The presenter was John Gallagher, formerly a writer for Film Comment whose floor Raimi had crashed on during post-production. Five years later, Raimi returned to The Directors to promote EVIL DEAD II, and the resulting interview is full of in-jokes and rarely-aired stories. It is sourced from a YouTube video, so the quality is far from perfect. This interview with a relatively sedate Sam was filmed for the syndicated TV series STEPHEN KING’S THIS IS HORROR (aka WORLD OF HORROR, or SHADOW THEATRE). It is from the only DVD available of THIS IS HORROR, released in the Netherlands, and features burnt-on Dutch subtitles as a result. Great work so far! Have you tried contacting the YouTube uploader to see if you can get a better source? The YouTube uploader is actually the interviewer John Gallagher, and since he's a friend of Raimi's I'm not so sure that would be wise. Very excited to see this!!! This sounds like it should be awesome. A 6 disc set for all three films would be really great. As I said earlier I'm still looking for suggestions for anything I might have missed out! I bought the cool French 2-disc version of the film recently which features a cool 25-minute exclusive interview with Bruce, though I'm wondering about the legalities of putting it on here when it's on a official release that's still in print. Moth3r, advice? I don't remember if this was on any of the featurettes, but I remember a few years ago when someone was auctioning off a remake of a B&W ED2 poster that was made to promote the financing of the film in Variety magazine. The subtitle states "Evil Dead and the Army of Darkness" and the auctioneer mentions that Raimi was planning to make ED2 set in the past like AOD became. Anyway, I have a small image of that poster, that probably is too low res. for the DVD, but I can send you if you like. in a french magazine I have from the 80s, they published storyboards of the ED2 you are taking about, like AOD became. I can scan them if someone wants them? Whilst Crimewave was in production, Raimi was developing Evil Dead 2: Army Of Darkness, or as it was actually called then, Evil Dead: 1300 AD. (It was also for a time called The Medieval Dead.) But Dino De Laurentiis persuaded them to keep part two in the cabin and wait until the third one to do the 1300 AD storyline. Raimi talks about this a bit in the 1987 Directors interview listed above. Success! I found the EVIL DEAD skit where all the stars of the original film re-enact it to hilarious effect in front of an audience! Will upload and let you know further! Many thanks to Lacerated for some uber-cool ED2 images that will most definitely be on the set. Ash595, I'd still be very interested in those pictures if you want to send me a PM, or alternatively I can PM you my e-mail address. Just to note as well that I caved in and e-mailed the YouTube uploader (who it turns out is actually Ira Gallen, the director, and not John Gallagher) to see if it would be possible to get DVDs of the Raimi/Tapert interviews. (Though I didn't mention they would be part of this project.) We'll see. sure, send me your email adress by PM. Just to note, if anyone's able to find a copy of either the Greek or the Mexican original VHS releases of the first Evil Dead (by Video Standard and Videomax, respectively) then please do let me know, as it's quite important for this project. I've got a copy of The Evil Dead Musical. It is professionally shot, and was intended for promotional use originally. It mixes concepts and situations from all three movies, but I think it would be invaluable to a set of companion DVDs, such as the ones you are working on. Hmm... maybe. I downloaded the same version of ED The Musical you're talking about and, to be honest, thought it was a bit crap. Didn't like the songs and thought it was terribly forced and unfunny. I'm not averse to maybe having a disc devoted to it in the set, with the featurettes from the website and footage of Bruce's NY Q&A. This just keeps sounding better and better, I have the blood red laserdisc of Evil Dead 2 and the Beam Enter Super Theater Japan laserdisc of Evil Dead 1. What are the deleted scenes featured in the workprint? Just wondering if the lost Evil Ed dismemberment sequence is in it. I'm sure it's not, but that footage has been my Holy Grail since reading about it in my dad's Fangoria. - Temp music, sound effects and original production audio are present - "Workshed" sounds more overdubbed here than in the final film! And that's about it. Sadly no Chop Top or squirrel eating as those scenes aren't represented here. Still, it's of academic interest and worth presenting for completists. Yeah, I've seen Nicotero's footage in my Book of the Dead edition of Evil Dead 2 and a I got a few pics of Chop Top Ed from evildeadinteractive.com. Sorry I bugged you, but it's hard not to get your hopes up when you see "Evil Dead 2 workprint featuring deleted scenes." It'll likely never happen, but I'm still waiting for someone to find that footage of Ed getting back up and raising hell. I'm gonna go check out these deleted scenes now, thanks for the heads up on that site! To be honest, I'd be surprised if those scenes haven't been long destroyed. More than likely is that they were thrown in a landfill when DeLaurentiis Entertainment Group went out of business soon after ED2's release. Excellent news on ED1. I told a Japanese contact about the Herald Videogram LD last winter, which he had bought, but hasn't responded about it since. He's probably swamped. I'm glad someone else was able to grab this.